So many stories and ages come together in the wearing of this one exquisite masterpiece. A shikargah Benarasi katan silk, its design dates back to approximately 400 years when the royal Mughals (harbingers and great patrons of the arts and of the Benarasi weave) spent a great many of their leisure hours engaged in hunting for sport (something I personally abhor but grudgingly admit, that to weave these scenes into fabric must have called for some expertise). Brocade and zari work in Varanasi reached new heights under the patronage of the Mughals, especially under the reign of Emperor Akbar. So a few years ago, I met this wonderful lady at Vastrabharana who was engaged in revivalist weaving work in the Benarasi tradition. We got talking and as one thing led to another I mentioned to her that I had this very precious, very old and now literally ‘falling apart’ saree that originally belonged to my grandmother. Could she possibly reproduce it? When I showed it to her, she told me it was a shikargah: essentially delicate traditional thread or zari work done on kimkhaab fabric depicting hunting scenes interspersed with all the usual Benarasi motifs, including floral and foliate patterns (kalga and bel), animal and bird depictions and the jhalar border thrown in. If you look closely it also features two tilted floral kairi butas or paisleys known as ‘konias” at the corners of the pallu: another unmistakable Benarasi feature. The effect is rather akin to the rich tapestries and carpets woven in Persia and other Oriental rug belt countries. (Instantly conjured up images in my mind of the romance, magic and mystique of places like Isfahan, Tabrez and Azerbaijan). 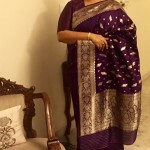 And without further ado, she set herself on the task of replicating my heirloom saree. When I saw the completed piece, my joy knew no bounds. I was told I was lucky to have thought of reviving this piece before all the old master weavers were ‘gone’. And so it sat it my cupboard all this time, till I thought of an ‘appropriate’ outing for it. And what better or more special occasion to show case this beauty than at my niece’s wedding last week. So out it was brought, the regal rustle of its soft silk and the sophistiacted sheen of its resham threadwork gently admonishing me for having neglected it for so long. I draped it with pride, happiness and gratitude. It was almost as though four generations of Indian women had suddenly been connected by the rich, precious and timeless legacy of Benarasi weaving traditions.